Origin and Habitat: Until today the habitat of the original description is not known. Horst and Uebelmann field collect plants apparently show that this species does not grow only in Paraguay but also in Argentina. Habitat: Frailea grahliana grows on flat sandstone at the edge of plates rocks, or on clayey soil among sandstone fragments, both in open an sunny spots or under grasses. The climate is warm and humid with hot summers and much thaw during the night. The winters are also warm even so occasionally light frosts may occurs, but the sandstone rocks warmth during the day and give off heat at night so rarely the temperature at soil level go below 5°C. It grows in association with Bromelia serra, Cererus lanosus and Monvillea sp. (paxtoniana?) that forms snake like stems. Echinocactus grahlianus F.Haage ex K.Schum. 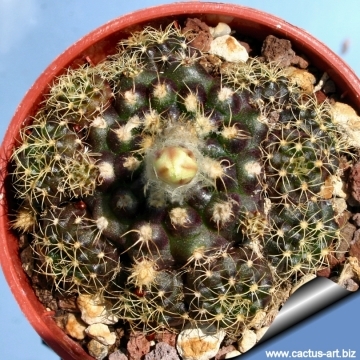 Echinocactus schilinzkyanus F.Haage ex K.Schum. Frailea schilinzkyana f. cristata hort. 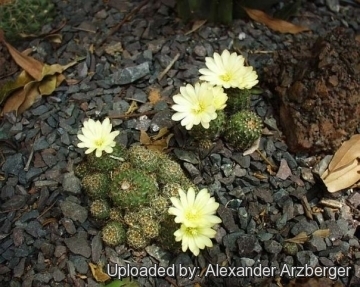 Description: Frailea grahliana is a common tiny and heavily clumping species that in cultivation can easily fill a 15 cm pot. It grows quickly. Note: This specie is known from a very long time and is generally included within (as a synonym of) Frailea schilinzkyana . In habitat the plants are highly variable and there are intermediate forms with Frailea pumila and Frailea friederichii and some botanists consider all the different plants of this polymorphic group as F. pumila. Stem: Dull-green, brownish-green to dark purple-green, top-shaped, depressed-globose, 3-4 cm in diameter and clumping around the base. Ribs: About 13 to 15 low and indistinct. Radial spines: 8 to 11 yellowish, subulate, flattened on the surface, appressed and curved backward, 3-5 mm long. Flowers: Pale to bright yellow, up to 4 cm long. Fraileas are cleistogamous meaning that their flowers produce seed without even opening. Without the need for pollination, hence the buds rarely reach full bloom and remain closed. They will open only in great heat in the hottest, brightest, afternoon sun, if at all. Frailea friedrichii Buining & Moser: stems solitary, dark green to coppery red, to 3-5 cm in diameter. Ribs 17-20, vertical, and forming tubercles. distribution: Cordillera and Paraguarí, Paraguay. Frailea perumbilicata F.Ritter: has stems typically flattened and umbilicate above. Ribs usually 15. Radial spines 6-10, central spines usually absent. Distribution: Rio Grande do Sul, Brazil. 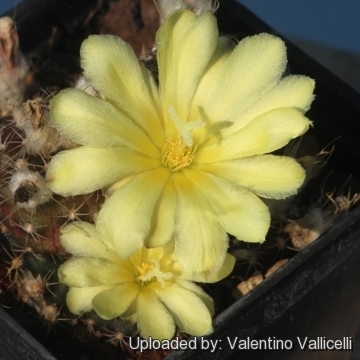 Frailea schilinzkyana (F.Haage ex K.Schum.) 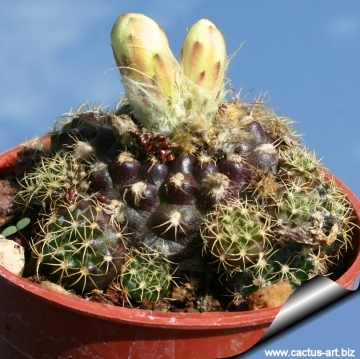 Britton & Rose: has small stems (ca 3 cm Ø) depressed globular dark brownish green. Ribs 10-13 tubercled. Spines 12 to 14, yellow to dark tannish-brown 2 to 3 mm long. Distribution: Brazil), Argentina, Paraguay and Uruguay. Frailea schilinzkyana f. cristata hort. : Crested form. Frailea ybatensis Buining & Moser: has less numerous spines, more numerous ribs, dark brownish-green or purple-violet stems, and citron yellow flowers. Distribution: Ytá-Ybaté, South East of Asunción, Paraguay. Notes: Most fraileas are autogamous, or self-fertile to their own pollen and self-fertilization occurs in the closed flower. 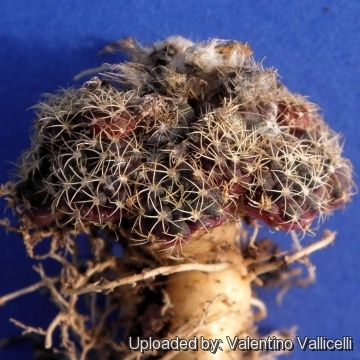 They produces viable seeds without the flower having opened. This phenomenon is called cleistogamy. 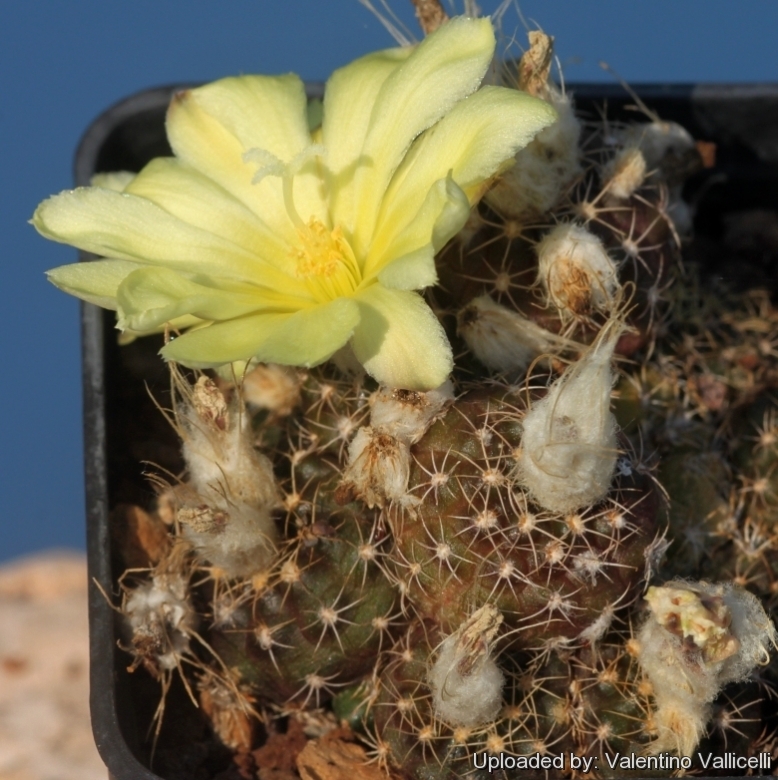 The accepted opinion is that Frailea flowers only open in full sun, otherwise fruits will form cleistogamously. 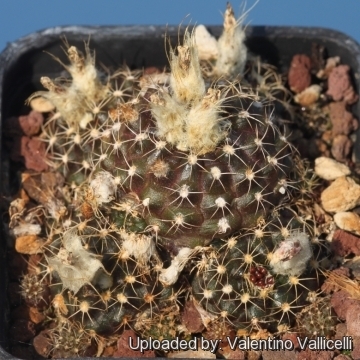 In reality relations are quite different: Both Frailea grahliana and Frailea schilinskyana produce buds in the form of a miniature plant of barely 10 mm in section, which do not open but which may still become seed-bearing fruits. Only when the young plants grow larger and are amply surrounded with offsets, do buds develop which pass into open flowers. Plants having open flowers for the first time, also produce again in the following year (pre-supposing that growth continues in the same manner) a few cleistogamous flowers first and after that open flowers. Only when the plants are so large that they flower with open flowers right at the start of the season, does this ability apply to even the smallest offset. Frailea aurea, Frailea carminifilamentosa, Frailea pseudograhliana, and Frailea pumilia, behave in this same way. Larger-growing Fraileas such as Frailea bruchii, Frailea dadakii, Frailea pygmaea, which seldom make offsets, bear fewer flowers. Here again, open flowers only appear on older plants. For every standstill in growth, the plant answers with cleistogamous flowers - in the summer weather too. In the event of the standstill in growth occurring in spring - for instance owing to repotting - then open flowers only come in summer. This will have led to the wrong opinion, that Fraileas flowers only open in full sunshine. 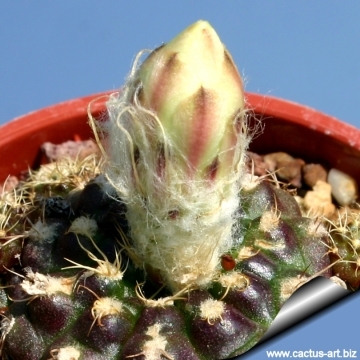 Cleistogamous buds are initially conical, then shortly a change occurs in the bud development - that part of the bud at the base starts growing thicker and petals are never formed. The buds that form flowers grow a slender egg shape and open quite some time later. Under normal circumstances the flowers opens in the greenhouse at a temperature above 20°C. They stay open only a few hours around noon, and they do not open again the next day. It is of interest that most of the open flowers do not form seeds if, one does not assist by pollinating by hand. 4) Backeberg, “Die Cactaceae”, 1959. Cultivation and Propagation: Grow them in rich, porous soil and let them dry out between waterings. 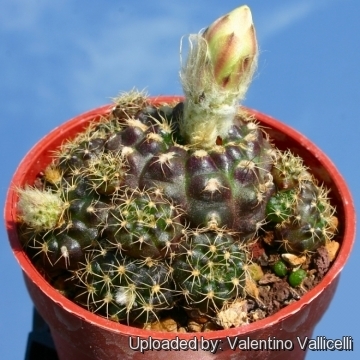 These plants need a minimum temperature of 5-10° C (but occasionally temperatures of a few degrees below 0° are not dangerous). Sun Exposure: It enjoys full sun, and it can take on a near black appearance when kept in bright light. In a shaded position the plants grow faster, but are not flat shaped and dark coloured. Propagation: With fresh harvested seeds or (rarely) by grafting.